Los Angeles is one of the most famous cities on Earth. With Hollywood, Beverly Hills, Disney theme parks, stunning beaches, and so much more to see and do, it’s no surprise that Los Angeles is one of the most visited places in the entire US. The city attracts tourists and travelers of all ages and backgrounds, offering them a myriad of activities to enjoy. People who live and work in LA famously like to stay active, with areas like Venice Beach well known for outdoor gyms, surfers, skaters, and more. If you want to enjoy some fun physical activity in Los Angeles, why not check out a roller skating rink? Los Angeles has so many different things to see and activities to enjoy. One of the coolest things to do in this California city is check out a roller skating rink. Offering daily sessions of roller skating, along with opportunities for private parties, lessons, and more, these are the best roller skating rinks you can find in the LA area. One of the friendliest and most welcoming roller skating ranks in Los Angeles, World On Wheels is known for providing a warm, homely atmosphere for everyone who steps through its doors. It's a great place to come with friends or try to make new ones, with a really stylish, modern rink and skating sessions and events available six days a week. The great thing about World On Wheels (known simply as WOW among the locals and regulars) is that the schedule is always being shaken up to include fun new things. This rink runs the usual services like all ages sessions and adults-only nights, but will also organize fully unique events like 'Old School Hip Hop Night' or 'R&B Night', letting you skate along to your favorite tunes. All admission fees come with free skating equipment and the rink can be booked out for private parties too. A far cry from the modern matte-black style of World On Wheels is the retro fun of Moonlight Rollerway. 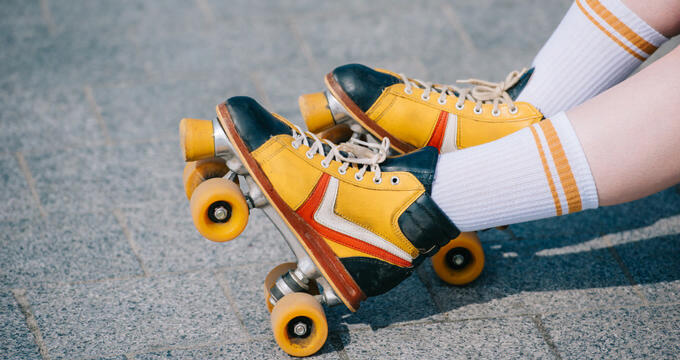 This traditional roller skating rink has preserved all the magic that made this activity so beloved in the past and brought that fun and passion into the 21st century. An 80s-style disco ball hovers above the rink and the whole place is decorated with a vintage style that regulars and new visitors simply fall in love with. The home of the Moonlight Rollerway was built back in the 1940s and actually became a roller skating rink in 1956, so there's a lot of history at this location and the current owners have paid homage to that history in all the right ways. The rink has even been featured in TV shows and films due to its retro decor and cool style. Open skating sessions can be enjoyed here often, along with private parties, classes, group bookings, and more. One of the very best rated roller skating rinks in Los Angeles and the entire state of California, the Northridge Skateland is beloved by all. Featuring one of the biggest skating rinks in the area, measuring approximately 12,000 square foot in total, this location was built to host a whole lot of people and regularly attracts big crowds. Operating in the Northridge area for over six decades now, Skateland also has its own live DJ playing the latest hits to enhance your skating sessions, along with sound and lighting effects too. Huge video screens can be found all around this location, along with a large video game arcade, a superb pizza restaurant, and even free Wi-Fi.